This post has been a few days in the writing, but now is a very good time to put these ideas out because now I have a great segue into it. We have reached the crossroads folks, and we have to make a decision. More and more people are becoming “awake” to the fact that our government stopped listening to us awhile back. We did not want a bank bailout; it happened, and over half the money went to foreign banks. We did not want the stimulus plan; a $1.2 Trillion fiasco; they did not read it and passed it anyways. We said “let the corrupt companies fail”, that did not happen. We do not want the $3.7 Trillion Budget being put forth by the fascists in charge, and Nazi Nancy and her buddy, Prince Harry, “I need you to believe that we can do anything we want, so why fight?”, are going to make that happen too. We do not want our taxes to be increased anymore, that’s definitely on the way. It is abundantly clear to me that the people we elected to govern the country have decided to no longer listen to us and follow our wishes as was laid out in the Constitution of the United States. How much more blatant does it have to be? A tea party scheduled for April 1st has been cancelled because the City of Cape Coral, Florida felt more than 500 people were going to attend, therefore requiring the organizer to obtain a permit AND insurance. The news article makes it seem like the city cancelled the tea party, but fair is fair, and technically the organizer, Lynn Rosko made the decision. Did the City of Cape Coral box her into a corner? Well if it looks like a duck…. CAPE CORAL, Fla. – A tea party to protest government spending and taxing is canceled. Canceled by the government. Lynn Rosko planned to hold a tax payer tea party at Jaycee Park in Cape Coral on April 1st. The idea was announced at a Cape Coral City Council meeting, then an e-mail blast by the Republican Party and it was mentioned in the local media. With all of that attention, the City of Cape Coral felt there could be more than 500 people attending the tea party. WINK News spoke to the director of parks for Cape Coral. He says that even now if Rosko is willing to get insurance for the event he’ll likely re-authorize it. For now Rosko’s event is canceled, she’s encouraging people to attend the April 15th Tax Payer Tea Party in Centennial Park in Fort Myers. The clause the states wanted added into the Constitution is right there in black and white. “Congress shall make no law… abridging the right of the people peaceably to assemble, and to petition the Government for a redress of grievances.” There is nothing in there about permits and insurance, and the city laws passed requiring permits and insurance, (in hopes of deterring ‘the people’), are an abridgement just as much as the permit that I had to obtain to have a firearm. Our Constitution was put in place to constrict the power of the federal government, not control our every action. We now have another prime example of how our Constitution has been eroded by the powers that be in hopes of controlling us and turning us into serfs, and according to Dr. Bob Basso/Thomas Paine, they have done a fantastic job of turning us into spectators to our own demise. For months I have felt that a 50 million person march (or more) on Washington, D.C., shutting down the business of the capital might just get our elected officials attention. Maybe. Mr. Basso is correct in that every single Congressman and Senator that DID NOT READ THE 1100 PAGE STIMULUS BILL SHOULD BE FIRED, and I do not think waiting until next year sends the right message – you are fired now! Go home, your services are no longer required. When was the last time that they actually passed meaningful legislation that helped everyday Americans? Women got the vote in 1920? The repealment of Prohibition? Don’t even start with FDR and his ponzi scheme of Social Security. All of that being said, here are some suggestions that I urge everyone to tell their friends and family about, and then make it happen! Get a copy of the Constitution and put it in the front window of your home. 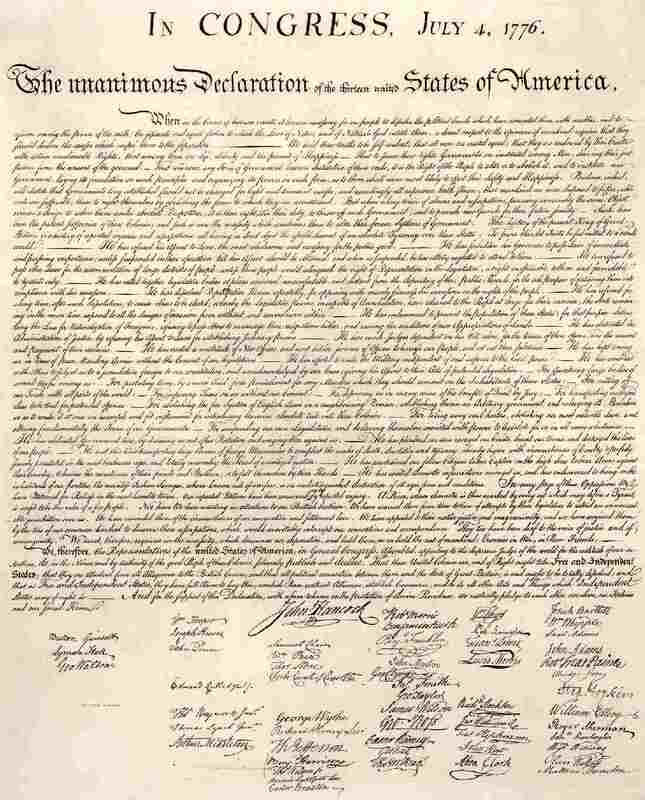 Print out copies of the following pictures of the Constitution and the Declaration of Independence. Send the Constitution to your congressmen and senators with the message, “The Declaration Is Coming Next”. Don’t waste your postage sending it to the White House, he is too busying partying, and he has proven that he does not have your best interests at heart with his additions to the $78.6 TRILLION Deficit. If they send you one of those patronizing, condescending form letters back, start sending them a copy of the Declaration as often as you would like. Start talking to everybody you know about going to Washington DC – and soon. 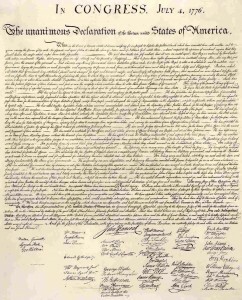 It is our duty and moral obligation to the Founding Fathers, every man or woman who has fought and DIED for our liberties, every legal immigrant that has made this country great, our parents and grandparents that made this country flourish, and OUR CHILDREN, to reign this suicidal, Constitution shredding, government in. I, for one, do not want to slide off the fascist cliff that we are being so slowly led to. How many of you think twice about what you say or write? There is your indication! This also includes the abolition of the Federal Reserve System so that we no longer have to pay interest on money that OUR TREASURY requested be printed. A central bank system set up by the very corrupt bankers that are ruining our country right now is enough reason to get our sorry behinds off our couches and out into the streets! The Tax Day Tea Parties are a great start, but we must think BIG! The time has come. Sitting on the fence, the sidelines, or our thumbs is no longer a choice. We have a right to peaceably assemble. It’s time for a gathering of the tribes. I’m getting ready too! It’s way past time for pitchforks and torches. Now you know I have to be at my tea party, I started the whole the thing in Wichita. Now we have our own executive committee. I am going to start contacting media this week to get the information out. The first will be an in house radio interview with myself and a volunteer from another county. I read all the comments from that article in FL. The people are going to do the tea party themselves. They are not going to be stopped by the powers that be. Some have espoused showing up at the next city council meeting. I think the people in Cape Coral will get it together on their own! I love their courage and bravery. They don’t intend to be stopped! By the way I am just itching to go to DC. I intend to be at the front of the crowd….they will know I am there because my Boston accented voice will be one of the loudest there! I will just have to get a bullhorn! The closest tea party is almost two hours away, but I’m going to get there. I’m also mailing and emailing my Congressmen a picture of a tea bag, probably multiple times. My most recent email garnered no response from one Congress person, a patronizing email from another, and one where the guy stated he didn’t like where government was headed either (that was the Republican rep). After the tea bags will be the Constitution and followed by the Declaration of Independence! The Cape Coral tea party is back on…because of us. Glad to hear the tea party is back on, DT. When basic freedoms are being threatened, then it is time for action. I am glad the tea party is back on. Sweet! Power to the People! God bless each and every one of you here! Sure is great to have my Firefox back! I’ve missed all you guys.